I need to preface this review with two things. 1: I enjoyed the first in the series, but I wasn't blown away because of the pacing and lack of conflict. 2: I've struggled to connect when I listen to an audiobook. 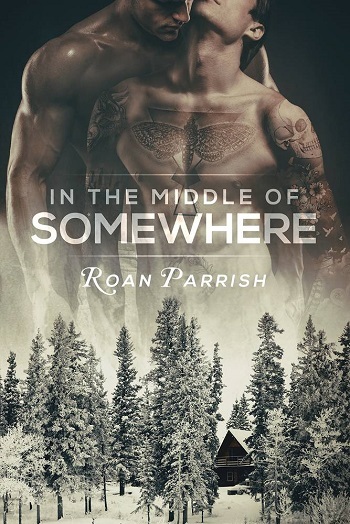 If you haven't read/listened to In the Middle of Somewhere, I suggest you not read Out of Nowhere as a standalone or out of reading order. The characters interconnect, and the emotions meant to be elicited wouldn't have the impact without reading in order. First, this series doesn't have a ton of bells and whistles, shock-value writing, or unrealistic angst used to propel the plot forward. Basically, whether it be book one or two, the narrator is struggling with inner demons holding them back from living life to the fullest – completely about character development and building. Note that the books read longer than their page-length due to the slower pacing of the storyline and the content held within. Mostly, I didn't have the same issue with this book as I did with the debut in the series, simply because Colin was a darker, angst-filled character who had self-loathing, guilt, mourning, and an intense fear causing him to lash out before he could be hurt first. In a nutshell, Colin and Rafael weren't as perfect as Daniel and Rex. Their faults made them seem more human, more palatable – more interesting in my opinion. Readers may not be able to connect and empathize with Colin, still seeing him from Daniel's point of view. I think it best to look at both sides, seeing neither right or wrong, but right and wronged by the other party based on their perception of the situation. Colin reminded me of people in my personal life, whom I understand but have a difficult time dealing with. Hopefully some who read this book will maybe take a moment for some self-reflection and ask themselves what energy they put out into the world, and how much energy they take away. Together, Colin and Rafael have an interesting dynamic, almost as if Rafe is addicted to Colin in an unhealthy way, which was an added boost of angst that was much-needed. Their relationship was definitely a slow-build, left to smolder hotter and hotter with tension and chemistry, instead of the instant gratification felt between Daniel and Rex in the first book. In audio (and while reading the ebook for book one) the author's habitual use of starting a scene in a specific point in time, for about half a page, then diving back into the recent past for several pages without denoting its occurrence, is often times highly confusing – more so in the audio format. Example: Yesterday afternoon was the chapter prior. The current chapter starts out as this morning, and a half page later the reader is thrust into last night for a few pages without anything denoting the change, then thrust right back into this morning – again, without a segue. Ebook or audio, this is highly confusing, and tore me from the story. It's like a rewind to what would have occurred in a scene between the current one and the one prior, playing catch-up without having created a chapter to house said information, sometimes with the addition of dialogue, then diving right back into the current scene without a segue. I rated this book 5 stars due to my entertainment factor – but if I were being critical, this is a habit in the author's writing style I hope they come to break in the future, for the readers' sakes, or at least add a proper segue before and after the addition of the 'rewind' information in the present scene. The scenes between Dan and Colin were appreciated, but I wish there had been more featuring Brian and Sam. Something that felt more like closure. All-in-all, the storyline was solid, endearing, inspiring, and with the addition of a feisty kitten too. I've tried a handful of audiobooks recently, and in the past, and found it increasingly difficult to enjoy the experience or connect with the story itself. I wasn't sure if it was the books I was listening to not fully capturing my interests, or the fact that I have a hearing-impaired person in my home (even when watching and hearing the TV, I always read the closed-captioning) I felt that way with audio, as if I needed to see the words as I listened. Out of Nowhere – even if I found a few parts repetitive/redundant and/or droning on with detail or inner monologue, or found the timeline shifts confusing – the book and its narrator made me an audio convert. I enjoyed myself immensely, finding the pleasure of listening to a book while being able to do other things freeing. The narrator was amazing. I'd give him 10 stars if I could. There were times I felt he sounded like Rick Castle (Castle) *laughs* and other times there was a cadence in his voice that reminded me of an uncle of mine who is no longer with us. So there was a bittersweetness to listening to the narrator. His use of varying tones during narration to denote other characters, without it coming off as cheesy or forced, the use of a raspy edge during scenes of high emotion, the pauses and sighs, all of it added to the overall enjoyment of the experience I doubt I would've felt had I not been listening to the audio vs reading the novel. I'm looking forward to diving into book three in this series. I loved Out of Nowhere, quite possibly even more than I loved In the Middle of Somewhere, which I loved pretty freaking hard. One of the most astounding things about these two books is that Parrish is able to illustrate how differently two people can see the same events because it’s painfully clear that Colin and Daniel’s versions of their childhood were at odds. And this was apparent well before Colin and Daniel have the chance to actually talk about it because as Colin tells Rafe about growing up in his family, his father, and his brothers, especially Daniel, his memories seem to contradict what we learned from Daniel in book one. The big thing we learn is that the Mulligan men have a tendency to assume what the others are thinking and feeling, yet none of them liked to talk about feelings – and this inability to communicate nearly destroys the tentative happiness that Colin is finding with Rafe. 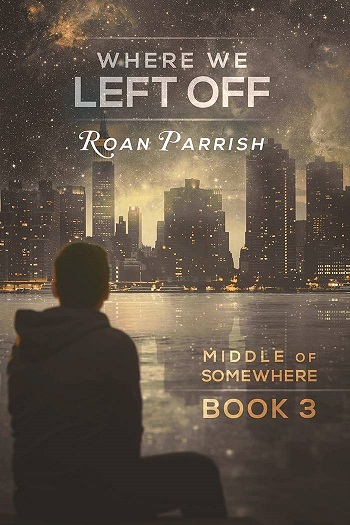 I strongly recommend that you read In the Middle of Somewhere first because the frame of reference it will provide for Colin and his family, as experienced from Daniel’s point of view, will make Colin’s journey of self-discovery even more meaningful. Truth be told, I wasn’t a fan of any of Daniel’s brothers while reading In the Middle of Somewhere. However, with the way that Colin went missing when their father died, I absolutely had to read (or I should say, listen to) this book. Parrish revealed just enough about what seemed to be going on with Colin that I had to know what was really transpiring with Daniel’s most ardent tormentor. Out of Nowhere actually begins shortly after Daniel moves to Michigan, so a large chunk of the books run concurrently, but there’s very little overlap outside of the major life changing event for the Mulligan brothers – the death of their father. Prior to that, however, we learn more about Colin and, in my opinion, discovered that he was a far more complex character than he seemed to be in Daniel’s book as his motives weren’t nearly as clear-cut as they appeared to be at first glance. This made witnessing Colin’s transformation over the course of the novel that much more fascinating, especially when Rafe entered his life and got him involved with the Youth Alliance (YA). Colin is an exceedingly angry young man because he’s living a lie, hiding who he was, lying to himself and his family, and has no life outside of the family business. But when Rafe enters his life and he discovers that the man’s presence calms him in a way that he hasn’t experienced since his mother died, he tries to cling desperately to both – living a lie and forging a relationship with a man. I loved watching how Colin found a purpose in life with Rafe and the YA. How working with the kids gave him reason to think about Daniel and question how different his brother’s life could have been with such an organization. I think that experience was vital to his ability to be more open during his conversations with Daniel later in the book. Also, Colin was forced to look into some pretty harsh mirrors when confronted by Daniel, by Sam and Brian (their other brothers), and by Rafe – and Rafe’s brought me to tears, not only because of the events, but because the narrator does such a good job of making me feel both Colin and Rafe’s pain and devastation. By being forced to reevaluate his life – both his past and what he wanted for his future – Colin was able to make changes in his life for his own happiness, changes that could lead to him living a fuller life for himself instead of the ghost of a life he was living for his father. Because this is Colin’s story and there is such a tie-in to the first book, I’ve said very little about Rafe because I don’t know where to begin and I don’t want to ruin the book for potential readers. I will say that I fell in love with Rafe – his passion for life, for the kids at the YA, for trying to make the world a better place, and, most importantly, his patience and love for Colin. I’ve said very little about Gross’s narration of the novel and I suspect it’s because I’m not entirely sure of how to express just how mesmerizing I found his voice to be, and what a wonderful job he did of bringing Colin to life and making me feel his emotions. Thanks to the writing talent of Roan Parrish and the narrative talent of Spencer Goss, I know that Out of Nowhere is an audiobook I will listen to again and again. For reviews & more info, check out our In the Middle of Somewhere post. For reviews & more info, check out our Where We Left Off post. 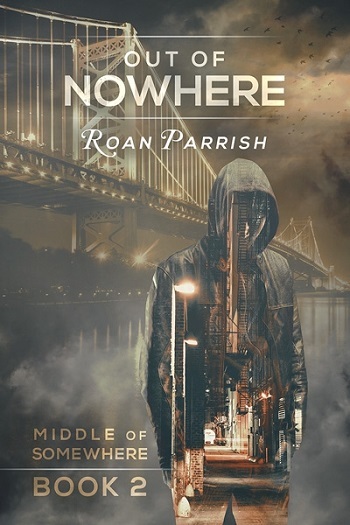 Reviewers on the Wicked Reads Review Team were provided a free copy of Out of Nowhere (Middle of Somewhere #2) by Roan Parrish, Narrated by Spencer Goss to listen to and review. Angela reviewed her personal copy of the audiobook.